Living with chronic illness is hard. Even when we are empowered to reclaim our health and live a vital and beautiful life, that’s not the same as a cure. It’s natural to grieve the life we had before, when life seemed easier, and our bodies were more predictable. What feelings are normal to experience? What do we do if we feel stuck or overwhelmed? In today's podcast, we provide a roadmap for moving through anxiety, shock, fear, denial, anger, guilt, grief and shame. We also talk about what acceptance really means, and how to cultivate the strength of resilience. 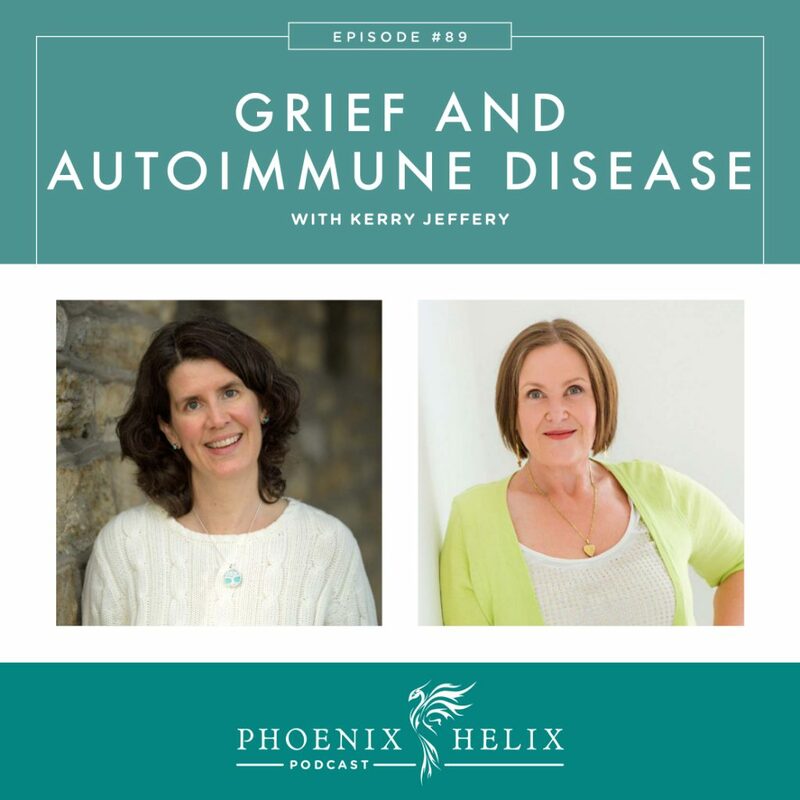 Kerry Jeffery is the blogger behind Emotional Autoimmunity, where she writes about the emotional side of life with autoimmune disease. She is also a counselor and has autoimmune disease herself. 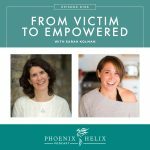 She recently wrote a short book called Moving Through the Grief of Chronic Illness, and that's the topic of today's podcast. You may have noticed this podcast aired a few days early. I'm going on vacation and wanted to make sure you didn't miss an episode. We'll be back to our regular every-other-Friday schedule in 2 weeks. On the weeks between podcasts, I write articles on my blog. 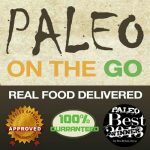 I recently began a new written interview series of Paleo AIP Reintroduction Experiences. If you don't want to miss out, subscribe to my weekly newsletter. 2 seasonal items on the menu just in time for Valentine's day: Strawberry Vanilla Cake and AIP Sugar Cookie Dough with Pink Icing. She has multiple autoimmune diseases herself, including: celiac, Hashimoto's and antiphospholipid syndrome. You can listen to her personal healing story in Episode 50. She writes about the emotional challenges of life with autoimmune disease on her blog, Emotional Autoimmunity. She has a series of video interviews, including an interview with me as the guest. And if you sign up for her email list, you'll get a free copy of her book: Moving Through the Grief of Chronic Illness. She's also a professional counselor and hypnotherapist and works works with people around the world via Skype. It takes an average of 4 years to receive an accurate autoimmune diagnosis. During this time, it's common to experience anxiety, confusion, and self-doubt, especially if your lab tests come back in “normal” ranges. Doctors sometimes assume your symptoms are psychosomatic. How to move through it: Calm self-advocacy. Educate yourself as much as you can. Calmly and clearly request appropriate tests from your doctor. If your doctor refuses, seek out another doctor. And if you aren't able to be calm, ask a friend or relative to accompany you to the doctor's office and advocate on your behalf. Ep. 67 – Building Effective Doctor-Patient Relationships. Tips for Getting a Proper Diagnosis of Autoimmune Disease. Getting a diagnosis validates your experience that something was wrong. That's the relief. The shock comes when you're told it's a lifelong diagnosis with no cure. The amount of shock is influenced by the doctor's bedside manner, their ability to help you with the treatments they offer, and whether you've experienced past traumas. This is a life-altering diagnosis, so it can be traumatic, and it can also trigger past traumas as well, amplifying the feeling of overwhelm. How to move through it: Understand that your feelings are normal and valid. Getting help from a counselor who specializes in trauma can be very helpful. Having honest conversations with your loved ones is also important, so you can get support. Ep. 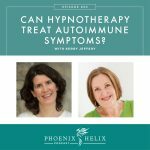 108 – Trauma & Autoimmunity. National Center for PTSD: Finding a Therapist. Kerry does offer trauma counseling and works with people around the world via Skype. Talking with Children About Serious Illness. Often, it's the health unknowns that we fear the most, and this strips away our feeling of safety and security. Fear can also play a movie reel in our mind of worst case scenarios. Fear breeds denial, and denial feeds fear. It's a vicious cycle, and it's easy to get stuck here. The problem is that we can't take positive action for our health if we don't acknowledge we have a health problem. Becoming chronically ill doesn't take away life's responsibilities, so we often try to power through, thinking, “I don't have time to be sick.” Yet eventually our bodies will force us to stop, and the longer we stay in denial, the greater the potential health consequences. We also sometimes fall into magical thinking: that if we don't accept the label, it's not real. Denial is meant to be a short-term coping mechanism that helps us regroup before we move forward. How to move through it: Bring your fears into the light and look at them. While this can be difficult, they have more power when we don't. Ep 41: Emotional Freedom Technique. Ep. 59 – Self-Inquiry with Byron Katie. When something bad happens, it's natural to search for a reason and something to blame. Anger can be empowering and help us move into action. Where it becomes negative is when it shifts inward, and we start to see our bodies as our enemies. Guilt often arises when our illness interferes with our roles and responsibilities. We feel like a burden on those who love us, sometimes we question whether we are worthy of that love now, and parents often fear they are bad parents and somehow damaging their children. Shame arises when we feel judged by others (or judge ourselves) for being the cause of our own illness. There is a negative message sometimes expressed in the mindset community – that we cause physical illness by not working through emotional blocks. While the mind-body connection is real, it's not that simple. It is one factor that influences health, but we can't use it to magically cause or cure illness. How to move through it: Realize that you and your body are in this together. You are worthwhile person, regardless of your health status and abilities. You are not the cause of your illness. Offer yourself the same love and compassion you would a good friend in the same situation. 10 Things My Chronic Illness Taught My Children. Explaining chronic illness to others: Spoon Theory. An online store, where everything sold is compliant with the elimination-phase of the Paleo Autoimmune Protocol. 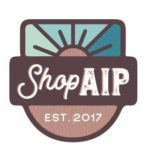 They sell a wide variety of products, including protein bars, AIP-friendly spice blends, cooking and baking ingredients, snacks, non-toxic skincare, and more. Place your order here, and use the code PHOENIX for 10% off your first order. Grieving the loss of self – the person you used to be. Grieving the loss of favorite activities you can no longer do. Because autoimmune disease is a chronic illness, each flare can take us back to this phase. Sometimes we fear that if we let ourselves tap into this grief, we'll be overwhelmed by it. How to move through it: Allow yourself to feel it. It validates your experience and tears really are healing, both from an emotional release perspective but also a detoxifying perspective. Feeling the grief moves us forward. Chronic illness can be very isolating and can impact our relationships. Sometimes our loved ones don't understand what we're going through. It's common to feel alone, even in a family setting. Symptoms of depression: withdrawing from family and friends, crying for “no reason”, lack of pleasure in things that used to bring you joy, feelings of worthlessness, feelings of hopelessness, a desire to sleep all the time or an inability to sleep, and sometimes depression is accompanied by suicidal thoughts. Depression isn't always emotion-based. Inflammation in the body also affects our brain. Mental challenges can coincide with an autoimmune diagnosis. Any actions you take to reduce inflammation body-wide will also help reduce inflammation in the brain. Denial and depression can also go together, because if you force yourself to “power through” in spite of symptoms, it will often leave you physically and mentally exhausted. How to move through it: Recognize the signs and symptoms, and reach out for professional help. Sometimes medication is warranted. Unicorns and Rainbows: The Myth of the Paleo Panacea. 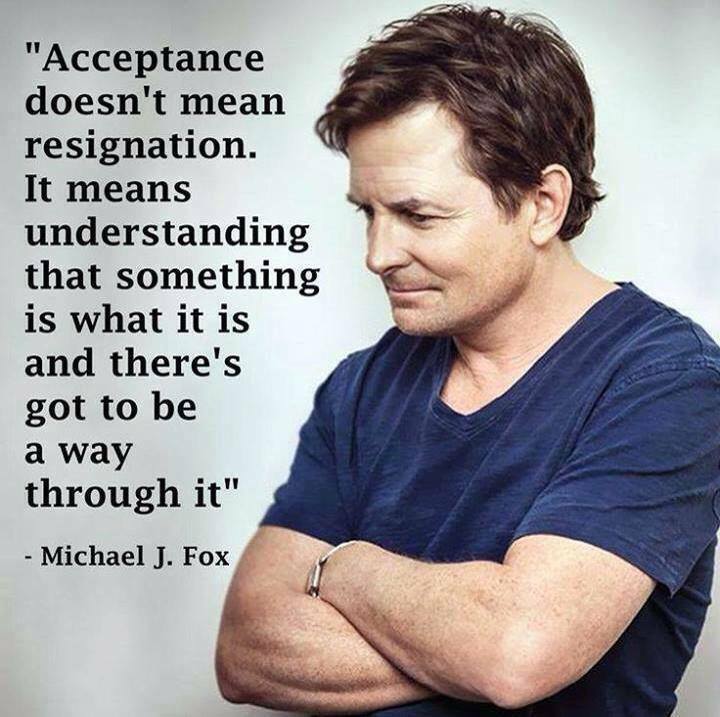 People often mistake acceptance for giving up, which isn't the same thing at all. Acceptance is simply making peace with reality, and from that place, we are more able to take appropriate action. Hope is inspiration for that action. There are many autoimmune success stories online to help us see what's possible. Surrender during a flare allows us to stop and do what's necessary to take care of ourselves. Resisting a flare often extends it. Surrender can be soothing. Acceptance is a prerequisite for effective action. This phase combines empowerment with responsibility – knowing that it is up to us to determine our quality of life. While others can support the process, we are in charge of our choices. Autoimmune healing is a marathon, not a sprint. There are lots of interventions we can try. Pace yourself and pick one at a time. And track how you feel. Journaling Your Way to Better Health. N=1: The Art of Self-Experimentation. Life's greatest challenges also bring unexpected gifts: discovering purpose, accessing inner strength, finding community, developing self-love, prioritizing health, etc. The more we can see around and beyond our suffering, the greater our quality of life. Since autoimmune disease involves remission and flares, we stop taking things for granted. We can develop a deep appreciation for good health when it's here, and resilience in supporting ourselves through flares when they happen. Resilience is a skill that we cultivate with practice and experience. Mark Sisson Quote on Resilience. Ep. 109 – The Science of Gratitude. Not everyone goes through every phase, and the time spent in phases will vary from person to person. In addition, it's not a linear process. With chronic illness, it's common to cycle back through these phases. The more experience we get with supporting ourselves through the process of grief, the less often we get stuck in the painful phases, and the more resilience and compassion we develop for ourselves. Kerry's blog is called Emotional Autoimmunity. If you sign up for her email list, you'll get a free copy of her book: Moving Through the Grief of Chronic Illness. She's also a professional counselor and hypnotherapist and works works with people around the world via Skype. She offers a free 20-minute discovery session. And she hosts a group on Facebook: Emotional Autoimmunity Recovery Support.